The front yard “assemblages” featured in my Virgin Territory photo essay are inventive, idiosyncratic, and sometimes bizarre, but such visual flights of fancy are not limited to front yard displays centered around religious statuary, nor even to the exuberant seasonal displays—especially at Christmas and Halloween—that Somerville has become known for. In this photo essay I focus on a handful of fascinating year-round displays that take the idea of front yard décor to another level, expressing the homeowners’ love of multiplicity and profusion for their own sakes, and transforming their front yards into public art installations. By referring to these front yards as follies I don’t mean to imply foolishness—which is one of the definitions of the word—but rather, in reference to the qualities defined by another of the word’s definitions: “whimsical or extravagant structures built to serve as conversation pieces, or to lend interest to a view.” This goal, I believe, Somerville’s Front Yard Follies accomplish in spades. The theme of this display on Spring Hill Terrace (off Highland Avenue), seems to be an homage to excess itself, as there is no discernible rhyme or reason for the hundreds if not thousands of tchotchkes occupying every available square inch of the front yard, steps, walkway to the back yard and even the trees. Here is proof that the whole can be far greater than the sum of its parts! Given my interest in religious displays, I have also noted the modest Virgin standing watch outside the house next door, who looks strangely calm as she gazes upon her neighbor’s wild extravagance. 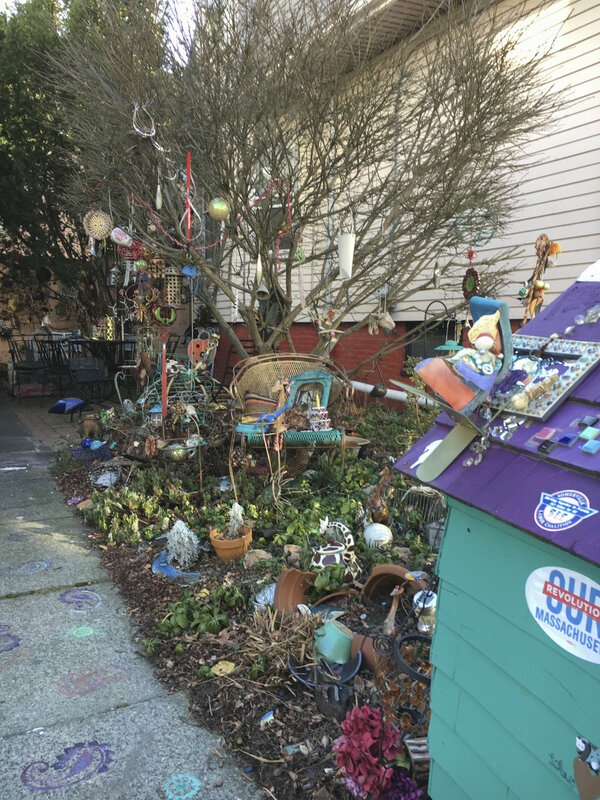 Indeed, as I’ve wondered how any one individual has managed to collect such a dazzling array of stuff, I’ve speculated whether neighbors and friends have also contributed to this overflowing display. I myself, currently in a downsizing frame of mind, have thought about the many items around my house that I’d like to pass on that would fit right in here! I say displays, in the plural, because the whole is comprised of multiple smaller displays throughout the front, back and side yards, each with its own particular color, configuration and thematic content—yet they remain connected to each other through the common intensity of solid colors: orange, blue, silver and red. The displays have changed over time and by season, although—in contrast to the exuberantly chaotic Spring Hill Terrace display—the color schemes and thematic coherence of each grouping indicate a governing aesthetic. 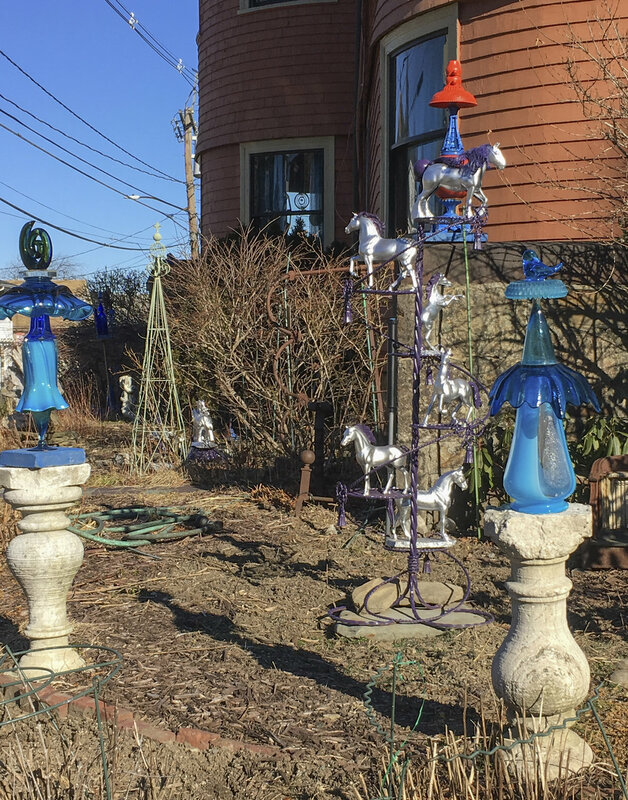 For example, arrays of blue glass bottles have always (in my recollection) adorned the front yard, although they have been positioned in different locations and configurations; similarly, the positions of silver, red and blue horses, elephants, dinosaurs and other animal themed collections, have varied over time. All of the colors contrast vividly with the orange color of the house itself, which serves as a backdrop. 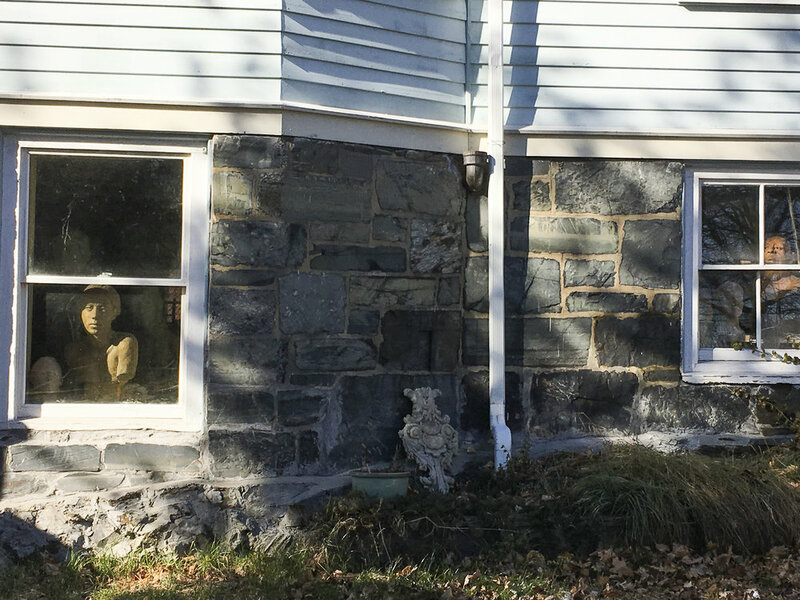 These photos capture what this house looked like in late 2018/early 2019, but I’m guessing it might look quite different a year from now. The displays in the side and back yard areas, which conform to the dominant orange and blue color scheme, can’t be seen from the well-trafficked Highland Avenue, but can be enjoyed by turning the corner from Highland Avenue onto Sycamore Street. One exception is an area with objects whose color scheme is a dark green, but it’s difficult to see without trespassing (and that display may even be in the neighbor’s back yard). The Kirk Dog Park and Duck Speakeasy, on Hanson Street, is another unique display with multiple discrete sections that is hard to capture in a single photo. It has gone through changes over the years, and I wish I’d photographed it each time I passed by, to capture the transformations. The first time I saw it, quite a few years ago, the display had two prevailing themes. (I do not know if these themes were developed sequentially or simultaneously.) One theme, centered on the left side of the entrance, was canine: gold dog figurines of all sizes and breeds—hence the sign indicating “Kirk Dog Park” on the side of the house. The coloring on the dogs was mostly a golden yellow, but some were painted a more reddish, burnished hue of gold. Alas, the dogs’ gilding has faded and chipped, and more naturally-colored dogs have been added, diminishing its once uniform and striking gold-ness. The second statuary theme was ducks, also gilded. The ducks occupy the space to the right of the front entrance, and the owner has put up a faux historical marker adjacent to the ducks’ area informing viewers that the neighborhood, once the location of one or more speakeasies, became known as Duck Village during Prohibition, when bootleggers “ducked” the authorities. Below, the photo of the ducks on the left was taken in 2016; the more recent one on the right, from 2018, shows that the ducks’ domain seems rather diminished. I’m not sure when that happened. Lions, gargoyles and other creatures, also gilded, resided in a yard embellished by truly idiosyncratic topiary shapes carved from the hedges. The front entrance itself changed dramatically at some point, when the columns were painted bright red, disrupting the gold-ness of the yard, and a similarly bright red knight in armor was placed next to the door. In some ways I miss the coherent visual focus of the gold dog-and-duck themed menagerie, but I have to say, I look forward to what’s next. CORNER OF LOWELL STREET AND BARSTOW AVE. 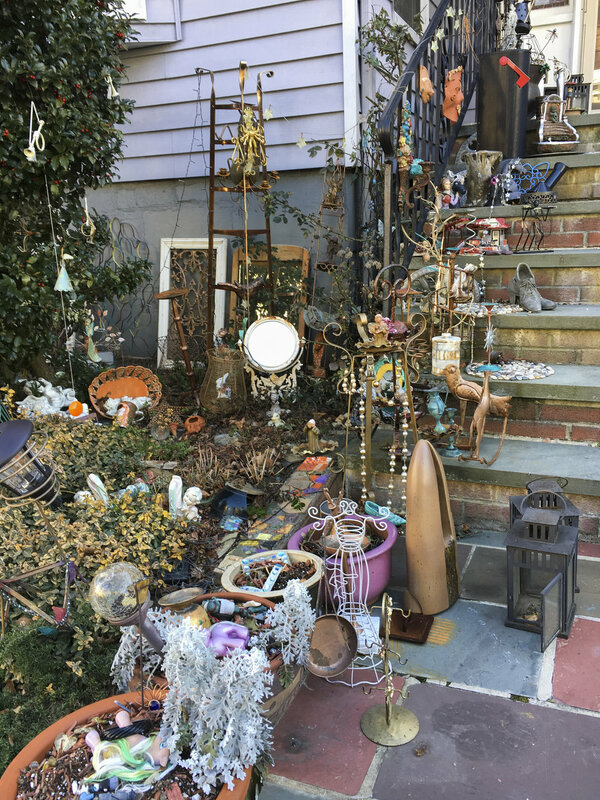 So far the front yard displays featured in this photo essay have been composed of found or purchased objects, placed in artful ways by owners with very personal aesthetics. 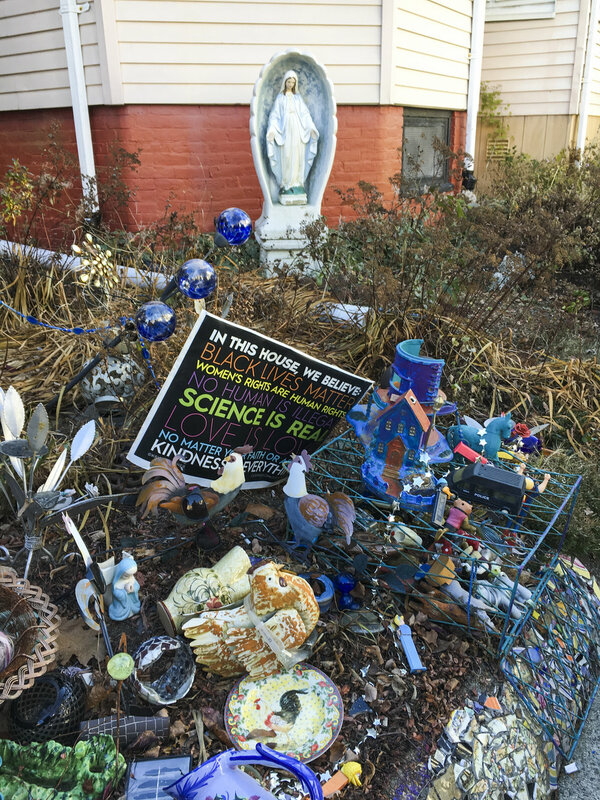 Here is an unusual front yard display in which objects produced by the homeowner-artist him or herself—four sculptures of human figures, and a bust of a woman’s head—have been placed on the retaining wall of a yard eight feet or so above sidewalk level; a fifth figure is reclining on the ground in the driveway. The yard in which the figures sit in repose is shaded by trees, giving the assemblage an aura of serenity and quiet contemplation that, to me, also invokes an occult or mystical space. Given the height of the yard and the shading of the trees, the sculptures are only partly visible from the street—unlike the other displays above, whose colors and visual excess instantly attract the gaze of anyone walking or driving past. Adding to the sense of mystery, other figures peer out of the windows of the ground level of the house, which I imagine is the artist’s studio. This unusual display at 80-82 Rogers Avenue combines found manufactured objects—a gargoyle, a toaster, a toy-like metallic player piano being played by a figure with some sort of helmet on—with rough stone sculptures. The stones are also “found” objects, but they have been carefully arranged by the homeowner-artist so as to become sculptures: a human figure, an arch, a toad stool, a cairn, and, somewhat whimsically, pieces of toast in the toaster. The petrous aesthetic of the display suggests to me that the assemblage is meant to invoke ancient stone sculptures at places such as Stonehenge or Easter Island; indeed, the sign attached to the porch with the words “Hawaiian Vibe,” indicates the latter may be the inspiration. Another sign on the porch directs viewers to a website—Alexthejester.com—which of course I visited, and learned that the jester, whose full name is Alex Feldman, lives in Somerville. Since the house has two apartments, maybe Alex is the artist—although nothing on the website suggests Alex the Jester is also a sculptor—so maybe the artist resides in the other unit. When I was photographing Somerville’s religious displays back around 2010, this lavishly decorated house was one of my favorites—it had it all: a Virgin in an ornate grotto, lions, patriotic figures and so much more.. At Christmas time, it was a highlight of the city-sponsored trolley tours that drove passengers by homes with the most extravagant holiday lighting displays. Alas, a few years ago this house was sold and all of its decorations were removed. While this front yard display is no longer physically present, it will be remembered as one of Somerville’s finest front yard follies.